The most iconic figure in the history of Nicaragua is Augusto C. Sandino. The illegitimate child of a poor servant girl, a self-made man, and emphatic defender of sovereignty, was betrayed and killed ignominiously when he opted to negotiate for peace. His death launched a single-family dynasty which, not coincidentally, ended at the hands of a new generation of rebels who adopted his name for their movement. Miguel Littin, a Chilean leftist filmmaker, undertook the auspicious project of tracing the remarkable life of Sandino on film. The result is presented here, broken into parts of about 10 minutes each. This film receives our highest recommendation, because it tells one of the great stories which define why Nicaragua is so special. One can't know Nicaragua, its history, society and culture, without understanding Sandino, and one can't understand Sandino without loving Nicaragua. Patria libre o muerte! The Spanish courses offered at Estacion Biologica include a historical perspective and legacy of Augusto Cesar Sandino in today's Nicaragua. The modern term sandinista incorporates concepts of struggle, social justice, sovereignty and national dignity, and a rich history has been played out in which the term has been applied. The term holds both political and broad cultural connotations today in Nicaragua, and our Spanish teachers have personal experience in these concepts, to make your Spanish training directed toward the circumstances found in Nicaragua. The year was 1983. The cause was the Nicaraguan "contra" civil war, seen from within as attacks from outside. Sandinista Nicaragua faced a formidable enemy in the United States, the byword was defiance. Music was the medium. The event was the Concert for Peace, held in Managua, free to all, with musicians from throughout the continent. As this event demonstrated, the Nicaraguan Revolution meant something very special troughout the world. Among the performers in this video: Luis Enrique Mejia Godoy, Carlos Mejia Godoy, Amparo Ochoa, Adrian Goizueta, Mercedes Sosa, Silvio Rodriguez. Music and Revolution were the theme. When we free the earth of what imprisons our dreams. The names of the anonymous sowers of this field. Like a bird flying toward love, takes flight to make a nest in your breast. Is the task of one to love even in time of war. Peeling back the layers of Latin American society and culture to make a volunteer or work experience, or a vacation, more interesting and fulfilling, requires learning Spanish. Among the educational programs at Estacion Biologica, is its oldest and most well-known in some circles, the Laguna de Apoyo Spanish School. 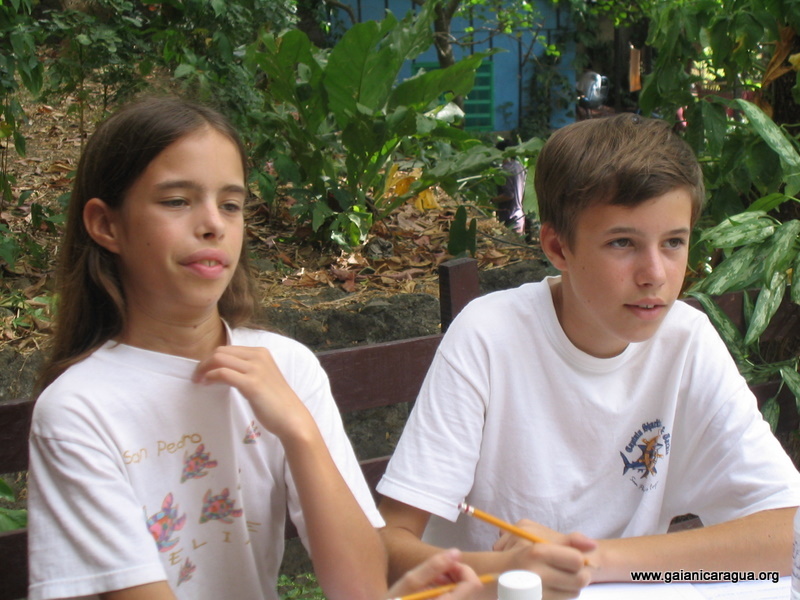 Our school is the oldest intensive Nicaragua Spanish language schools. We have developed our own curriculum and course materials based on our experiences with teaching visitors to Nicaragua. Our teachers are local people, whom we have trained and have passed the various requirements we have imposed. Our school has trained hundreds of volunteers, professionals and tourists over the past twenty years. We have even trained the majority of Spanish language school teachers throughout Nicaragua. Our intensive Spanish courses are one-on-one, or in small groups. We have special approaches for young people, including students as young as five years old. Classes at Apoyo Spanish School are often in the shade of the large trees in the yard of Estacion Biologica, during the mornings, and activities are programmed three afternoons each week. Our teachers assign homework, so a student might find him or herself busy into the evening and asking our staff for assistance! Even then, there is ample opportunity to swim, meet neighbors and enjoy the natural surroundings. Our intensive Spanish language courses include cultural training, pronunciation, verb conjugation, and vocabulary. We have experience in training volunteers and professionals working in several agencies in Nicaragua and nearby countries. You will be studying in the immediate vicinity of our other activities, such as wildlife research and reforestation activities. Years of experience on an institutional level means you can expect results in class, and have an overall experience that takes into account your needs for a total experience, with cultural and environmental activities, free time, intense study, conversations with locals, and exposure to nature in the tropics. We also believe that eating well is a part of any good experience. We think a lot about the food we prepare, serve and eat. We serve healthy meals three times a day, and your meals are included in your price of Spanish study. We accomodate special diets such as vegetarian, vegan, and with advance notice, gluten-free. Unlike most other schools in Nicaragua, we are a registered non-profit, with all permits and licenses in place, working hand in hand with the national and local governments and the community. 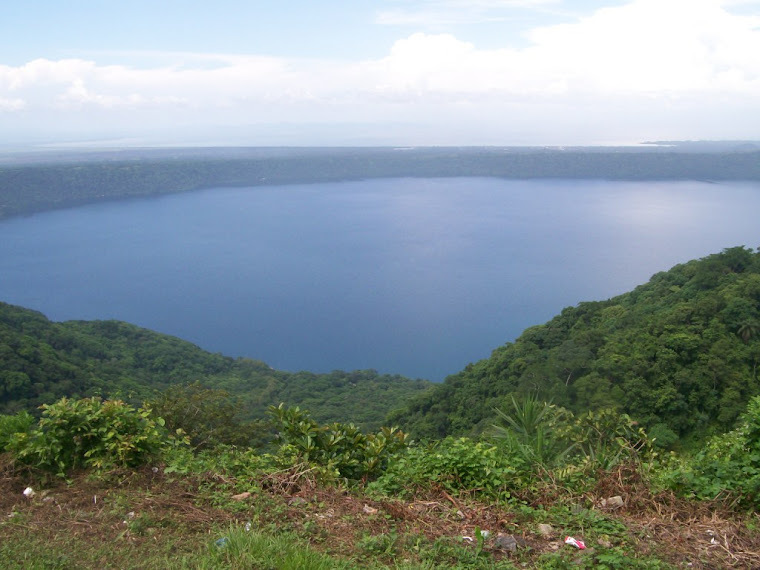 Some schools advertise that a portion of their profits go to worthy causes, whereas all of our profits are returned to support the local community in the sustainable management of Laguna de Apoyo Nature Reserve. Part of that support is to pay fair wages, pay social security and taxes according to the law, and work formally with the local structures in long-term development issues. Our proceeds, for instance, pay for logistical support for the local police; training for the park guards; building improvements and books at the local schools; development and implementation of the management plan for the Reserve; reforestation and wildlife studies in the reserve; and a number of other activities in coordination with the local communities. Our students participate in some of these programs, planting trees and monitoring wildlife, during their studies. In this way, you can be sure, your money spent does not go to line the pockets of some gringo, as is the case in most of the other schools. Whether you are in Nicaragua for tourism, residence, or professional reasons, we would like to meet you. You are welcome to visit any time, we are open 365 days a year. Please contact us at apoyo@gaianicaragua.org for more information. Nicaragua faces many challenges due to the immense poverty it suffers. Being handicapped is hard anywhere, but having a disability in Nicaragua can be like a prison, because the family, friends and society are not sufficiently equipped and trained to include them in productive ways. The following video, a television spot, deals with this issue. This video is also interesting because it is produced in Miskito, one of the "other" languages of Nicaragua. There is very little cultural space available for the languages other than Spanish, except of course for English. This video presents an interesting development in the treatment of cultures and languages by giving this message to the Miskito people in their own language. We hope this video gives you much to consider. If you are traveling to Nicaragua, please consider bringing with you a wheelchair. Estacion Biologica can facilitate its donation to a needing handicapped person. Do you know of someone who would like to volunteer to work with handicapped young people in Nicaragua? There are opportunities at Psycoballet Nicaragua. The Asian House Gecko, Hemidactylus frenatus, has expanded rapidly since its successful introduction a few decades ago. It is displacing native species? Photo by Rachel Lauwerijssen. Geckos are special animals. They climb on walls and ceilings, inhabiting all houses in Nicaragua, but they are wild animals, not pets. And generally, they are tolerated and even enjoyed by us bipeds. Their chirping, hunting antics, and those eggs found in boxes, shoes, and other enclosures are always innocuous and most often charming. And they are in the forests, too. It's common to see pictures of geckos in trip reports by tourists! Nonetheless, there is more to the story than that Nicaragua has geckos. In fact, there are several species here; in Laguna de Apoyo Nature Reserve, three species are present; two species are native, and one was recently introduced to Nicaragua. Two students from Holland, Rachel Lauwerijssen and Simone Blomenkamp, are studying these animals to determine what impacts, if any, the introduced species may produce on the native populations. Simone started her study a month ago, and Rachel has just finished in Spanish training, at Laguna de Apoyo Spanish School, and is now at full speed in the study, too. One of the species native to the area is the yellow-headed gecko, Gonatodes albogularis. The head of the male of the subspecies found in Nicaragua is more brick red than yellow, however. Although all geckos are collectively called perrozompopo (ant-dog in Spanish!) locally, some people recognize that this form exists, as opposed to the more neutral form (see above). It is generally more reclusive than the exotic species. This mail Yellow-headed Gecko is undergoing molt. The female yellow-headed gecko can be confused with other geckos without a closer look, given their neutral colors. Most commonly seen by Nicaraguans is the Asian house gecko (Hemidactylus frenatus), which was introduced into Nicaragua a few decades ago. This picture was taken on the wall of Estacion Biologica. It is not clear just how the Asian house gecko first arrived in Nicaragua, although some blame the Panamians, others blame the Cubans coming from Angola in the 1980's! At any rate, it is prolific, and highly reproductive, as the photos in a previous blog entry attest. Simone and Rachel are gathering data on the abundance of each species in a variety of habitats in Laguna de Apoyo Nature Reserve, to evaluate whether the introduced species has any impacts on the species native to here. They have study locations both in trees and in structures such as houses. 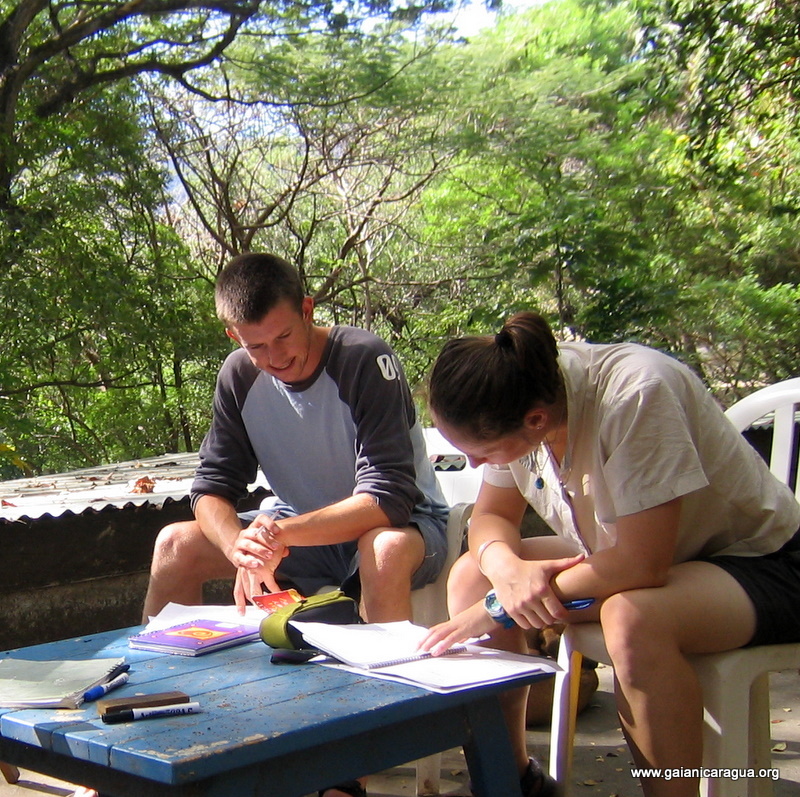 Simone Blomenkamp taking notes during field work in Laguna de Apoyo Nature Reserve. Photo by Witold Lapinski. Simone Blomenkamp photographing a gecko in Laguna de Apoyo Nature Reserve. Photo by Witold Lapinski. Neutral colors on the female yellow-headed gecko (Gonatodes albogularis) combine with a cryptic pattern to aid in predator avoidance. Photo by Simone Blomenkamp. A third gecko species is found in Laguna de Apoyo Nature Reserve, the yellow-belly gecko (Phyllodactylus tuberculosus). This species is much less abundant than the other two in all the habitats we have evaluated so far. In fact, about two weeks of intense study had passed before we sighted the first one. Yellow-bellied gecko, Phyllodactylus tuberculosus, at Estacion Biologica, Laguna de Apoyo Nature Reserve. Photo by Simone Blomenkamp. Nature photographers enjoy watching the geckos and other lizards of Laguna de Apoyo Nature Reserve, because they often give great photography opportunities. The sticky pads on Phyllodactylus tuberculosus feet in ventral view. Photo by Witold Lapinski. Finding the yellow-bellied gecko actually was not easy. Over one-hundred geckos had been sighted before the first one had appeared. The sticky foot pads, seen above, are distinctive for this species. The foot pad morphology will dictate the appropriate habitat for the species, and given that the pads are not as extensive as in the introduced species, we ask whether there are problems with aquiring appropriate habitat. We are focussing on how Hemidactylus frenatus may compete with this species for resources. Simone Blomenkamp photographs the first yellow-bellied gecko captured during the study in Laguna de Apoyo Nature Reserve, as Jeffrey McCrary holds the gecko. Photo by Rachel Lauwerijssen. The geckos captured in some sites are marked for a quantitative population study. Below, the yellow-bellied gecko with markings has been released near its capture site. Each marked individual has a unique pattern, allowing us to identify the individual when observing it. Yellow-bellied gecko, Phyllodactylus tuberculosus, marked for a population estimate study. Photo by Simone Blomenkamp. Rachel Lauwerijssen with a gecko in hand, during field work in Laguna de Apoyo. Rachel has just finished his study at Laguna de Apoyo Spanish Language School, and now he will devote his efforts to study of the geckos. Photo by Witold Lapinski. The Asian house gecko has often been blamed for the demise of native gecko species in other places, but in Nicaragua, no one has bothered to analyze the potential impacts provoked by the introduction of this species. We intend to generate specific information on habitats of each species, overlaps, fertility, competition, and potentially, predation for each species. The javelina or collared peccary (Pecari tajacu) is called sahino in Spanish. It is native to much of Nicaragua, and in the wild, is to be feared. It can be aggressive, and has long, sharp teeth, strong jaws, a stout body with the capacity to run fast, and they are social, usually found in packs of around twelve. In some natural areas where they are common, picnic tables may be placed in strategic places for the visitor who might find a need for refuge. They are not commonly domesticated, because they often remain aggressive even when bred in captivity. In 2003, Estacion Biologica inherited a rescue animal that the zoo could not keep. After living in an impoundment for years, he was released. He made friends with one of the dogs, and they played fondly. He was dubbed Greggery in honor of an opera composed by Frank Zappa. 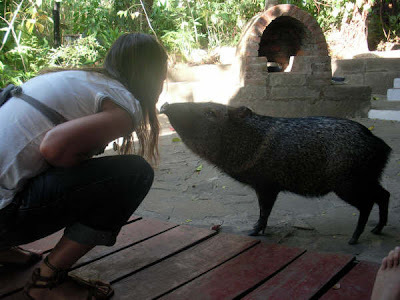 As all pets, he had his troubles, but with people he was never aggressive, and in time, his repulsive odor for which the peccaries are known diminished. Or perhaps we just didn't notice as much. 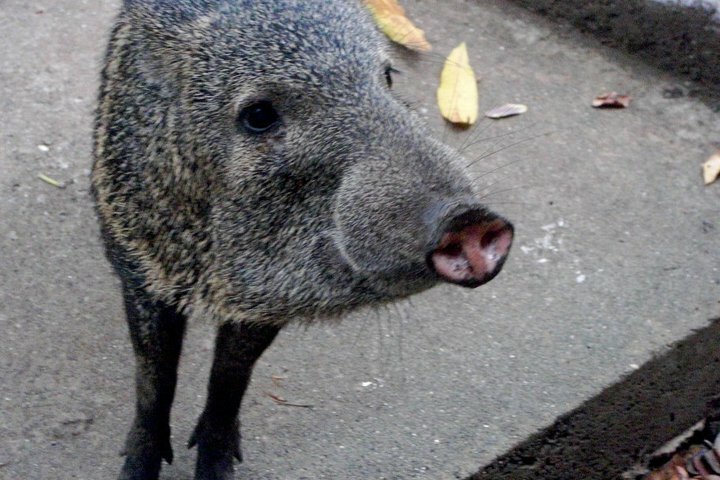 Much like the protagonist in Frank Zappa's operetta Greggery Peccary, our peccary became a star. He even had a video made and published! See the video below, thanks to Fabio Buitrago. As cute as Greggery was (may he rest in peace), we think wild nature should stay wild. The pet trade threatens our wild nature in Nicaragua. Greggery was brought from the wild to be a pet, and was traded commercially for that purpose. When you see wild animals in the street, remember that buying them only promotes the trafficking in wild animals further. The head of the collared peccary seems disproportionately large. Photo by Jeffrey McCrary. Greggery was good at charming the girls.